Great is this force of memory, excessive great, O my God; a large and boundless chamber! who ever sounded the bottom thereof?… The memory then is, as it were, the belly of the mind, and joy and sadness, like sweet and bitter food, which, when committed to the memory, are as it were, passed into the belly, where they may be stowed, but cannot taste. Memory, and the various perceptions of memory, has forever been the business of historians. It is unlikely to let up. Also, if you ever begin to browse Augustine, at least this work, you’ll note that he is very repetitive in pledging monotheistic allegiance — but this isn’t unusual, especially for a saint. Augustine of Hippo painting in Richardton Abbey, western North Dakota. The last time I sat down and read some Augustine was during a graduate historiography seminar with Dr. Jim Mochoruk at the University of North Dakota, Grand Forks. 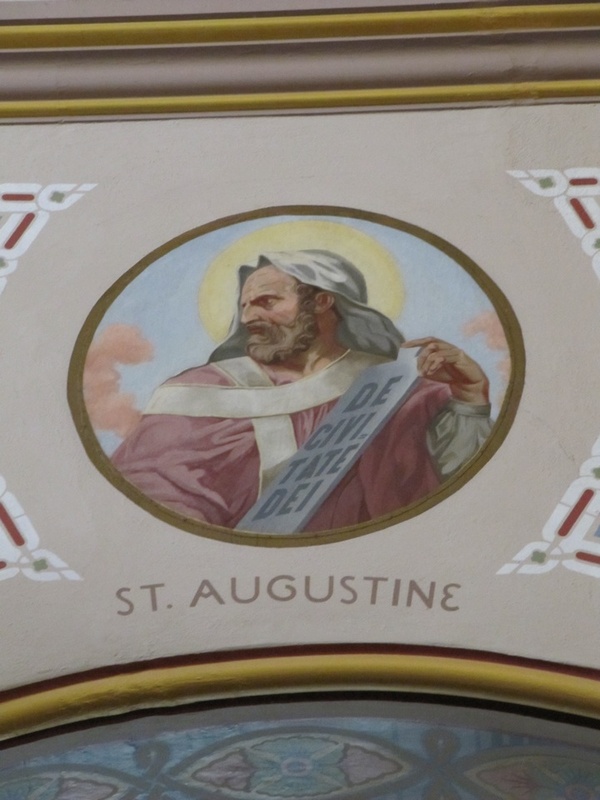 We did not read The Confessions, but instead read The City of God (or large chunks of it), the title of the work that is painted into the photo of the Augustinian fresco in Richardton Abbey, western North Dakota. When you enter the sanctuary, look up and just to the left. You’ll see Augustine. Memories from that class with Mochoruk: he required that we put together two term papers. I wrote one on David Hume and another on R.G. Collingwood, two more philosopher-historians who couldn’t stop thinking about memory, and thinking. I haven’t been able to stop thinking about Hume and Collingwood, and thinking about their thoughts as well. This entry was posted on Friday, March 9th, 2012 at 3:49 pm	and posted in Uncategorized. You can follow any responses to this entry through the RSS 2.0 feed.